I agree to share my website usage data for marketing analysis purposes. What is a document store? What is a public API? How to query a database? How to stream query results? How to work with Facet query? How to work with Suggestion query? How to work with MoreLikeThis query? How to send multiple commands using a batch? What is a session and how does it work? How to use Lucene in queries? How to use NOT operator? How to use transformers in queries? How to perform a faceted search? How to perform a multifaceted search? How to query a spatial index? How to perform dynamic aggregation? How to get query statistics? How to perform queries lazily? How to work with suggestions? How to change maximum number of requests per session? How to customize key generation for entities? How to customize collection assignment for entities? How to customize identity property lookup for entities? How to enable optimistic concurrency? How to work with bulk insert operation? How to subscribe to document changes? How to subscribe to index changes? How to subscribe to bulk insert operation changes? How to subscribe to transformer changes? How to subscribe to replication conflicts? How to subscribe to data subscription changes? How to create a data subscription? How to open a data subscription? How to delete a data subscription? How to release a data subscription? How to get all subscriptions? How client integrates with replication bundle? How to work with authorization bundle? How to work with unique constraints bundle? What is a files store? What is a file session? How to subscribe to file changes? How to subscribe to synchronization notifications? How to subscribe to synchronization conflicts? How to subscribe to configuration changes? 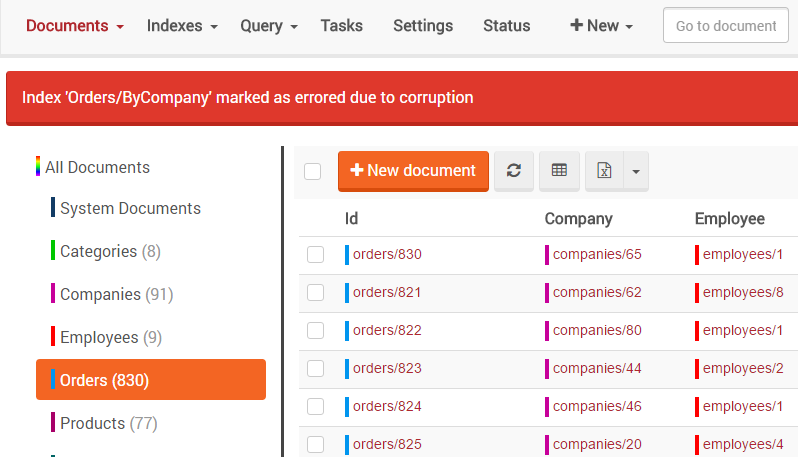 This view lists all available indexes in a current database and gives you the ability to create, edit, query, or delete indexes. Indexes are grouped by a collection they are working on and each index contains basic information, such as a number of indexed entries and locked state. After clicking on an index name you will be navigated to the Query View. To read more about querying in Studio, please visit this article. To edit index just press the Edit button available for each index. This will navigate you to the Index Edit View about which you can read here. When the Copy index button is pressed, the index definition is loaded from a server and a popup from which it can be copied appears. Later on this definition can be used to create a new index with the Paste action from the Action Bar (remember to change an index name). If you want to delete an index (with the indexing data) press the Delete index button in the menu. This operation cannot be undone. Resetting an index will remove all indexing data and start indexing from scratch. To reset an index press the Reset index button in the menu. You can read more about locking here. You can read more about index prioritization here. 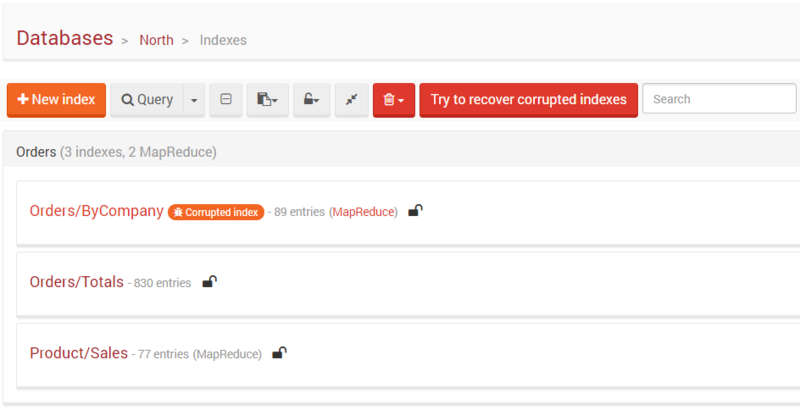 During server startup, we check for corrupted indexes. If such a corruption is found, the server attempts to fix it. It looks like your e-mail address is incorrect. Please provide a valid one.